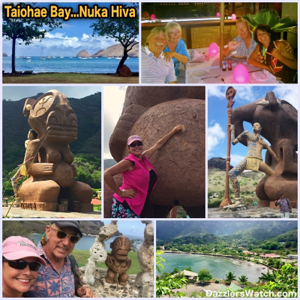 If you must be stuck somewhere for a couple of weeks I think I speak for both of us when I say that Taiohae Bay on Nuka Hiva is not a bad place to be “stick”. Now, the water isn’t the clear blue Polynesian water we saw at Tahuata and we’re not swimming here after having witnessed the shark feeding frenzy at the petit quay (dinghy dock) but this place certainly has its charm. And, since had to spend a couple of weeks waiting on our new generator, we decided to embrace our temporary home and assimilate ourselves into the village. So what does this charming little village have that makes it so wonderful? Well, let’s see. First of all it has four stores for food provisioning which is huge! If you’re not a cruiser you may no understand how big of a deal it is for us. When you are traveling in remote parts of the world, finding a good store with quality foods is a very big deal. Kamake Magasin, the blue one one the main strip just across the street from the Naval Memorial site has its own bakery so you get wonderful, fresh breads, baguettes, poi and others baked goods each day. Warning though…get there early as they sell out quickly. Just up the road a block on the same side of the street is Larson’s Market. They have much of the same things as Kamake but seem to have a little better meat selection. Be cautious when picking out meat as we paid 1800 CFP ($18 USD) for one package of two boneless, skinless chicken breasts. We bought two packages! This better be some darn good chicken! Further up the road and nearer to the other end of the bay there is yet another market. We went there once and I think they were about the same as the others. The Potuka Market is less frequented by cruisers as it’s not on the main strip and if you don’t know it’s there you’d likely never get up to it. This market is near and dear to us as they actually sold cases of beer all packaged up. These are easier to store and handle on the boat. Dan found them when Henry, the owner of Snack Vaeki took him to get beer a couple Sundays ago. To find them you make a right at the bank and they are up the road a few blocks on the left. We bought a case of beer and some other items at first. We left there and then Dan said, “Hey, maybe if we buy more they will give us a ride back to the quay”. So, we went back and bought another three cases and they did give us a ride in the big truck they use to get their supplies from the Aranui supply ship. Sometimes it just pays to ask. There is one bank in town and again, it’s on the main road. They have an ATM that is usually locked so you have to swipe your ATM card to get into the area where it is located. You find the bank, as you find most places, by leaving the petit quay and heading left around the bay. We dined out several times while we were there. The Snack Vaeki at the quay has awesome, fresh grilled tuna and great French fries! Dan had their sashimi tuna a couple of times too. Of course the tuna boats come in right at the quay and clean their fish almost daily so you know its good and fresh. They also have delicious chocolate croissants in the mornings. They are warm and yummy! They do not sell alcohol here but they do offer free WiFi. While we see many cruisers coming in and using the WIFI without buying anything we feel that’s just wrong. We feel it’s wrong to take up their valuable table space and not give them a little business. The least you can do is buy a soda, bottle of water or cup of coffee. We never utilize WIFI anywhere without buying something. It’s just the right thing to do. Almost daily the fishermen arrive at the quay to clean and sell their catch. This creates quite a wonderful show. The black tip sharks have come to know this will occur and so when the men toss the scraps and carcasses in the water a feeding frenzy happens. We saw a couple of these sharks that were easily three meters long. What’s interesting about this is that the dingy tie up is just about ten feet away from where this is happening. It certainly kept me on my toes as I stepped from dink to dink to reach the ladder on the wall. Something tells me that falling in and creating a large splash during the cleaning ritual would not be good. That said, within an hour or two of this we saw young children jumping off the quay into the water right where this all occurred. Speaking of children, what do they do for fun down here? Well, you certainly don’t see them with their heads stuck in computer devices or phones. What you do see is them riding bicycles, playing tag and spending time outside playing and interacting with each other. That goes for most of the cruiser kids we see as well. It’s rather refreshing to see kids actually playing together. One afternoon we saw about five kids playing on the beach right after the fish cleaning. There was about a five foot black tip shark swimming up near the shore. The kids were grabbing handfuls of sand and throwing it in the water. The shark, certainly thinking it was more food went into a frenzy each time a sand bomb hit the water. The kids were laughing and having a ball. Their parents were sitting on the seawall enjoying themselves and watching their kids play. I can’t imagine the chaos this would create in the states. The parents would probably be turned in to Children’s Services for allowing their children near a dangerous beast like that shark and the animal rights activists would be screaming that the kids were torturing that poor shark. Not here, the kids get to be kids. They fall down, get up and keep moving. And, the shark wasn’t harmed. Just up the road that leads from the quay is the Tematapuau Restaurant and they have fantastic food. I had goat that was prepared like a pot roast. It was served with carrots, potatoes, onions, rice and gravy. It was scrumptious. Dan had chopsuey and said it was really good as well. We spent a lot of time here as they also have WiFi. We go up for a beer and check emails, news, and of course, Facebook. The owners are very nice and the ambiance is perfect. There is a little gift shop attached at one end that has some beautiful carved pieces. I could have spent a fortune in there. And on the quay side of the restaurant is the fresh produce market that is open everyday except Sunday. In fact, you will find that most everything is closed on Sunday. It’s family time. The markets are open but only until noon. Snack Vaeki at the quay is open Sundays until around two or three. On the main road you will also find a couple of other restaurants. Moana Nui serves pizza, calzones and other Italian food in addition to steaks and some traditional Polynesian style dishes such as poisson cru. We’re not big fans of poisson cru so I can’t tell you if it’s good or bad. We had pizza here one night and didn’t really care for it but we came back on Polynesian Mother’s Day and had a delicious meal of prime rib and baked potatoes. They grill the prime rib, which is different, but the meal was exceptional. The evening of Mother’s Day was really fun. We arrived to find the entire restaurant decked out with flowers and lots of colorful decorations. They informed us that since we had no reservations they only had one table available near the bar. We told them we were fine with that. We were the only guests in the entire restaurant for about a half hour but before we knew it the local people started pouring into the place. The men and women were all dressed up for this special day. The men’s shirts were perfectly coordinated with the women’s dresses. Many couples had matching Polynesian prints. Every single woman had some sort of flower in her hair. Some wore very ornate, crowns of flowers while others had a simple, single flower tucked behind their ear. Even the very young girls had beautiful dresses and flowers. Everyone was in a joyous mood and there was lots of hugging, kissing and laughing going on. As the restaurant filled to capacity we noted that we were the only non-locals in the place. We felt as if we had been immersed into a secret society of some sort. It was truly wonderful to be a part of such a special day even if we were sitting at a separate table just watching the action. To our delight the band, a three-piece band, began setting up just across from us. We may not have had reservations and we may have been the only non-locals in the entire place but we had a front row seat. Yes, it was a wonderful treat. Kevin of Nuka Hiva Yacht Services showed up with his wife, Annabella, and their two children. They sat at the table beside us and we chatted with them briefly as our meal had just been served. As we enjoyed the giant prime rib the band began to play Polynesian style music. It was truly a delightful evening. On another evening we had dinner with Ed & Linda of SV One Fine Day at the Keikahanui Pearl Lodge. That was a wonderful treat as well. If you call them on channel 68 they will pick you up at the quay. We recommend calling an hour or so before you are ready to go. After your meal they will also return you to the quay. That’s a nice service since there are no taxis on the island. The lodge overlooks the bay. We sat outside by the infinity pool, which was lit up beautifully. The décor inside and out was fabulous and embodied everything you think of when you think of French Polynesia. And our meals, oh the food was spectacular and served in true four-star fashion with perfectly presented plates. Of course, it was a little pricey but the way we look at it, we’re only going to be here one time so we might as well enjoy our stay and experience everything we can. The best place to get pizza is on the far west end of the main drag just down the hill from the Pearl Lodge. It’s called He’e Tai Inn and it’s very easy to find. All you have to do is take the main road to the west end of the bay. Just before the road ends, it’s on your right. We were told the owner is a French baker and he makes the dough from scratch. It was the best pizza we’ve had since México. Like Moana Nui they don’t open until 6 p.m. and while we didn’t need reservations, if it’s in the busy season you might want to make them. So, what else is there other than food and provisions? Well, let’s see. The village itself is quite quaint and seems to cater to the cruiser. Just about everything you need is on the main road and there are stone tikis all along the road to provide interesting sights. There’s a me’ae (ancient site) near the cemetery about midway down the road. One thing that seems odd to me is that in many villages we’ve seen cemeteries that sit right beside the ocean. Not to sound morbid or anything but what happens when bad storms and seas come crashing onto the shore? Is it not possible that the bodies will come floating up from the wet ground and end up floating out to sea or worse yet, down the village streets? I know, sick thought, but these are the questions that come to my mind when I see this. The anchorage here is rather large and can support a large number of yachts. At one point I counted over 60 boats. The sailing ship, Rosehearty, at 55 meters was only one of a few that were well over 30 meters. The Aranui supply ship stops in each week and docks at the wharf where the fuel is located. If they are in port you can’t get fuel. We’ve read that some say this is a very roly anchorage however we didn’t find that at all. Yes, there were times we moved a little more than others but honestly we enjoy a little movement. After all, we’re on a boat, we expect to move. At the top of the hill on the east end of the bay is the Tūhiva Tiki. The tiki is the tallest contemporary sculpture in the Pacific. The female is 12 meters tall and the male warrior behind her is 8 meters tall. Each sculpture took 6 months to erect. In 1813 with the help of the local chief, Kiatonui, Commodore David Porter got the top of this hill fortified with four cannons. He named the place Fort Madison. Somewhere along the way it was renamed to Fort Collet and in June 1842 the Marquesas were taken over by the French. Later that year the fort was provided with military headquarters, barracks and a warehouse filled with gunpowder. Several more cannons were added at that time. In 1849 the French navy left Taiohae and the fort was left in the hands of catholic missionaries. In 1859 they turned it into a school and then a hospital. It’s not until 2013 that the fort was returned to the hands of the local authorities. The tikis were erected on the hilltop to celebrate this event. The designer wanted to erect something that would embody the Marquesan culture. According to the sign that discussed the fort and the tiki, the warrior gains his strength from the woman tiki, warden of knowledge and tradition, and he is stepping forth to master his future. As you can see in the photo, the female tiki is pregnant. There is a hole in her navel in which they encourage you to leave a message to memorialize being there. We added the date and signed one of our boat cards and inserted it into the navel. Now, you really need to see this site for yourself to understand how the designer, Grégorio Grand Midi, juxtaposed the tikis in such a way as to illustrate the warrior impregnating the female. Additionally, the, how can I say this? Ummm….The genitalia of both tikis is rather descript. I do have photos but will not be showing them. I’ll leave it to your imagination. Let’s just say that if you are taking young children to see this beautiful site you should be prepared for some pretty interesting questions. Anyway, the village is lovely, the anchorage is nice and the people here are so warm and welcoming. We instantly felt at home in this wonderful place. And, as I said when I began, if you must be stuck someplace, this is a pretty nice place to be stuck.